After years of using your garage, you have likely accumulated a lot of unnecessary and unneeded items. It is easy for this to happen because like the quote “out of sight, out of mind” we typically forget the things we do not see every day. Going through your garage and organizing it will give you peace of mind and even more space for things like your car! Remove Everything. This is usually the most difficult part because it takes the most effort to start. After you start removing everything from your garage, you will see how good it feels to see the walls again as well as everything else you had forgotten. This will most likely take you a few hours just to get everything removed so make sure you give yourself enough time. Clean Everything. You will most likely encounter a few spiders and bugs in your garage, so make sure you are using pesticides and proper cleaning equipment to keep them out. You will also want to wipe down all the walls and really clean your floors to make sure your garage gets a fresh start. Install Organizers. This step is not a necessity, but it will help you create an organized atmosphere in your garage. You will want to start with solid cabinets, shelving, and matching totes. These will help you get everything off the floor and onto the walls. You will also find space for seasonal items, random tools that were forgotten, auto cleaners, and even your sports equipment. Organize. This is my personal favorite part as you get to organize all your items and make your garage looks amazing again. Make sure to designate each area for your supplies so you don’t run into disorganization again. After each step is completed you will simply need to maintain your organized garage by running through it a few times a week. 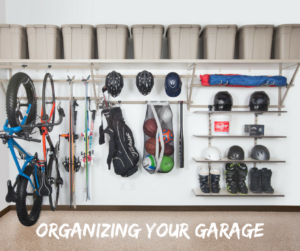 You are now on your way to an organized, amazing garage! This post was written by Kenny Pedersen at Organized Garage Solutions. He enjoys playing sports, having out with his wife, and finding great music to listen to.